Diamond Head, an extinct volcanic crater, and high-rises are seen in Honolulu on Saturday, Jan. 13, 2018. Hawaii Governor David Ige said the false missile alert that panicked islanders on Saturday morning was “totally unacceptable” and said the warning was caused by human error. Ige told reporters Saturday afternoon (local time) that he is “angry and disappointed” by the situation. “Today is a day that most of us will never forget — a day when many in our community thought that our worst nightmares might actually be happening,” he said. Questioned repeatedly by reporters about how such a mistake could happen, the governor said his administration is doing everything possible to make sure it does not happen again. ​The administrator of Hawaii’s Emergency Management Administration, Vern Miyagi, told reporters that the person responsible for the erroneous message “feels terrible” about it. Told by reporters that emergency sirens had actually gone off in some communities, Miyagi said he would have to look into the matter. 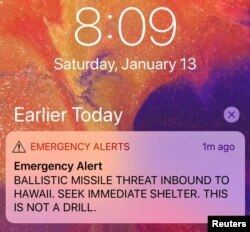 Hawaiians described panic when they got the emergency alert Saturday morning on television, radio, email and mobile devices. Hotel guests were herded into basements, while residents tried to find the safest places inside their homes. Some people were seen on video opening manhole covers to shelter underground. Donna McGarrity of Oahu was at home with her 30-year-old son when they got the alert. She said they took shelter in the center of the house, where she called her daughter in Vancouver, “just to actually tell her I love her, just in case we got bombed,” she told VOA. The mistake was discovered within 20 minutes, but it took 38 minutes for state officials to issue a correction on mobile devices, which brought criticism from islanders, government officials and the media. Hours later, McGarrity said she and her son are still shaken. “We just kept looking it up just to make SURE that it was, you know, a false alarm,” she said after the event. If it had been real, she said, they had been told a missile could have hit as soon as 12 minutes after the alert. “I’ve never had anything like this happen, where it could be imminent, where in just a couple of minutes we could all be dead,” she said. Earlier, Governor Ige told CNN television that the mistake happened when an employee simply erred. 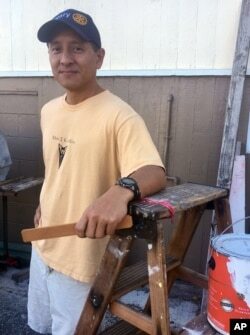 Richard Ing, a Honolulu attorney, is photographed as he joked it was probably someone's last day on the job, Jan. 13, 2018, when Hawaii emergency management officials mistakenly sent an alert that a ballistic missile was inbound to Hawaii. The U.S. Navy’s Pacific Command also confirmed that the alerts had been sent in error. Ajit Pai, chairman of the U.S. Federal Communications Commission (FCC), tweeted Saturday that his agency was launching a “full investigation” into the false wireless emergency alert. The FCC has jurisdiction over the nation’s emergency alert system. FILE - Sen. Brian Schatz, D-Hawaii, speaks during a news conference on Capitol Hill in Washington, May 24, 2017. Schatz said that "there needs to be tough and quick accountability" for the false missile threat tweet sent Jan. 13, 2018. Hawaii Representative Tulsi Gabbard told CNN television Saturday that the first message had started a panic. Just a few weeks ago, Hawaii reinstated its Cold War-era alarm sirens amid growing fears of nuclear aggression by North Korea.